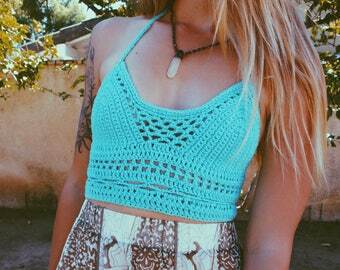 The hand crocheted Kailua Endless Summer halter crop is inspired by the Hawaiian islands where I designed and named it. Very versatile, wear with jeans, shorts, bathing suit bottoms or a maxi skirt to lounge by the pool or attend your favorite music festival. Made from %100 USA made cotton in Lilac (pictured, Cacao also pictured) or your choice from the drop down menu. 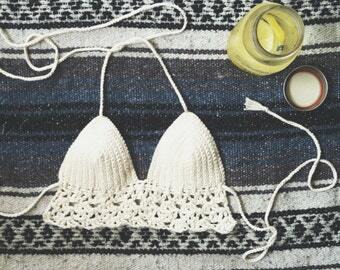 This top features simple triangle cups, decoratively edged with hand sewn on cowrie shells. The solid bodice is edged with a peephole picoted detail and features a corset style closure in the back that along with the swimsuit style halter string ties allow for a more customized fit. Each tie is finished with the signature Jayblue tassel featuring a single cowrie shell. Care: Hand wash and lay flat or hang to dry.